On the 3rd day of Pannonian BirdExperience on Sunday afternoon an excursion took place on Hrušovská zdrž water reservoir on the Danube River that lies in the outskirts of Bratislava, capital city of Slovakia. This large water body is a part of Gabčíkovo hydroelectric power plant. 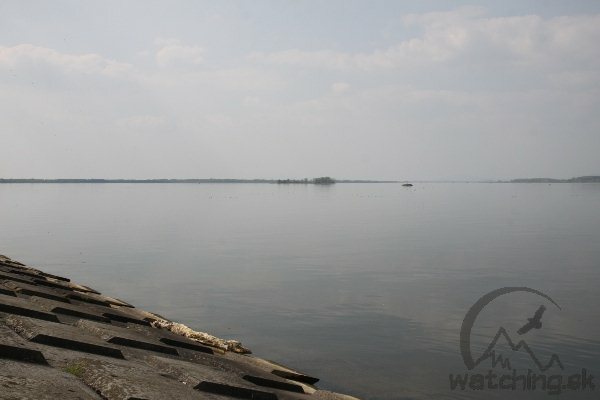 This large water reservoir provides very good conditions for wintering of waterfowl in Slovakia and is a part of a major international migration corridor. The man-made water reservoir and waterway is surrounded by fragments of original floodplain forests that are part of IBA Dunajské luhy. 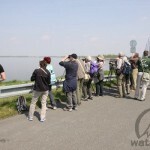 In cooperation with the Slovak Ornithological Society/BirdLife Slovakia we took an opportunity to guide this excursion. We were enjoying probably the best weather conditions of this spring as the sky was almost clear with a temperature of 18°C and lots of sunrays. 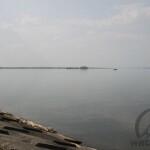 Without any evidence of wind we have seen the most calm water surface ever in this part of the Danube River. During our excursion we observed several interesting bird species with the total number of 44.